If you are interested in beating cancer with nutrition, mainstream medicine is not what you should look at. This is because the emphasis is much more on burning the cancer cells rather than moulding the body’s system to enable self healing for cancer treatment. Nonetheless, even in mainstream medicine, many foods are being increasingly recognised as powerful cancer fighters, apart from being overall health boosters. Boost your immune system – For starters, you need to cook your foods in the right manner. This basically means avoid eating stuff that builds an environment of disease in your body, such as junk food. Apart from junk food, even homemade foods high in salt, sugar, unhealthy fats, and devoid of essential minerals and vitamins should be avoided. 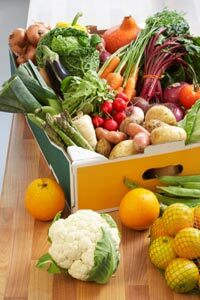 Vegetables, fruits and other fibrous foods help to create an environment of improved health in your body. Avoid meats and fatty foods – The vitamins and minerals contained in fruits and vegetables help to prevent cancer and also treating it with nutrition. They are essential for helping you rebuild damaged cells. Although you need to avoid all meats, red meats are particularly harmful. If having only fruits and vegetables is proving to be difficult, blend them together. Do this only till you are in your condition. Do not cook your foods on high heat. You do need to ensure that your food gets soft but choose naturally softer foods for this. When you cook on high heat, the food loses its nutrition. Ensuring that food is well cooked is not the same as cooking on high heat. By cooking for long, you increase the risk of nutrient losses due to time of cooking. Cooking for long but on low flame is much better for ensuring its nutrition. This helps to retain its nutrition. Make sure that whatever you eat is full of nutrients, so that even if you eat a little, your body gets the required nutrition and helps in treating your condition. Whatever foods you eat should act as natural healers for your body. Good presentation of food is also important if you want to enjoy it. It helps to boost your appetite which might be lost due to cancer. If you are able to ensure that the food that you eat supplements your immune system and makes it stronger, it would gradually help you beat cancer with nutrition. Take the help of your health care provider to monitor your condition.